Takin’ It Easy at Fresh & Easy! 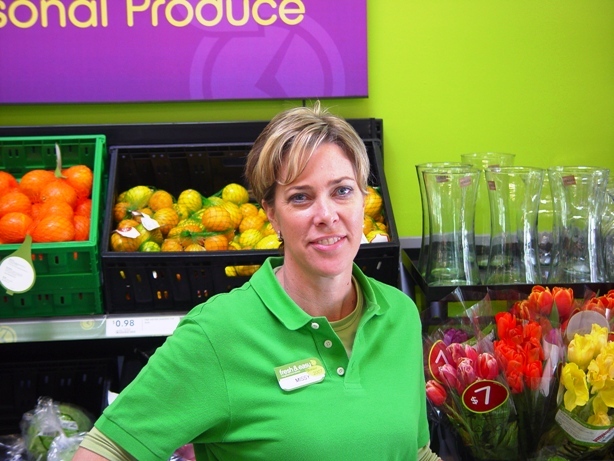 Missy Flores manages the new Fresh & Easy. If you call yourself Fresh & Easy, then there are two criteria, you better meet or exceed. You better be fresh & easy. And if your prices are also low, too, you’ll keep customers coming back! 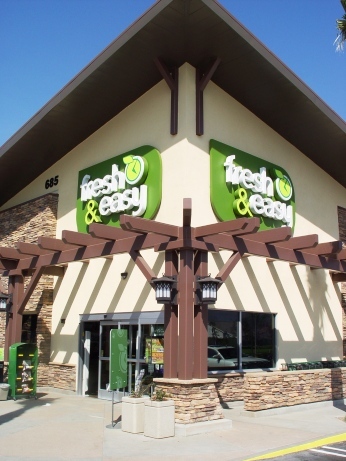 We’re happy to report that Fresh and Easy’s newest location at 655 E. Bonita, caddy corner to Holy Name of Mary Catholic Church in San Dimas, passes muster along every aisle of the store, which opened on February 23. Upon entering the store, you’ll find rows of fresh fruits and flowers (three pears for 99 cents were a sweet and crunchy bargain). We also bumped into store manager Missy Flores, who was as bright and as helpful as the sunlight streaming on the eye-level SKUs and highly polished mocha cement floors. “My personal view is we’re fresh and easy,” Flores said. “We do the shopping for you. You don’t have to spend 30 minutes looking for through 200 different tubes of toothpaste. We took Flores on our word, scooting over to the personal hygiene section, and sure enough, stacked neatly and nicely were tidy, trim packages of Crest, Colgate, Fixodent and Sensodyne. Fresh & Easy is caddy corner to Holy Name of Mary Catholic Church in San Dimas. Seeing my interest swell, Flores took me to Fresh & Easy’s prepared meals section. Fresh & Easy also has a reasonably priced gourmet line, including mouth-watering choices like Chicken Milano, Fontina Chicken, Apricot Pork Tenderloin and Mediterranean Salmon. Flores finally had to tend to other customers, so I struck out on my own, evaluating variety, judging quality, and assessing the ease and availability of picking up everything I would want to fill my grocery basket with – everything from fresh to frozen and some goodies in between. The chocolate-covered almonds at $3.79 instantly caught my eye, which made me think I’d no longer have to make the trek over to Trader Joe’s in Claremont for my nuts and snack packs. Nearby was a pound of roasted mixed nuts for $5.79. The cookie selection was also tempting: 13-oz. containers of soft oatmeal raisin cookies, old fashioned ginger snaps, shortbread and crispy peanut butter chip cookies, each priced at $2.99. It also didn’t take me long to discover 10 ounces of freshly baked blueberry scones for $3.99. They really looked scrumptious encrusted in a raw sugar. As for staples, it’s hard to pass up a 24-oz. loaf of whole wheat bread for $2.49 or a 40-oz Stouffer’s Macaroni and Cheese for $4.99. In the meat department, Fresh & Easy was offering Lime and Cilantro Chicken Breast at $4.99 a pound, Angus Ground Beef for $4.99 a pound, pork loin chops for $3.99 a pound, and chicken breasts for $1.99 a pound. I also like the downscaled portions. Now that I’m no longer feeding a football team at home or buying earthquake supplies, I don’t need an airplane hangar full of freezers stuffed with Sam’s or Costco multi-packs. The shopping and assisted checkout were easy. You check your own, but there’s plenty of help standing by, just in case. You can pay with cash or card. No checks. The experience was fast, fresh and easy on my shopping budget. What else can I ask for from a neighborhood market! 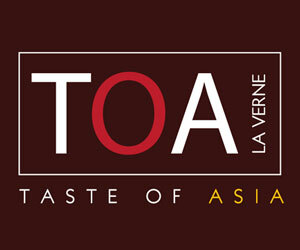 For more information, call (909) 592-5287. LaVerneOnline has great-money saving coupons. To see the list of vendors, go to the Home Page COUPON button and downloand your favorite!